Between the bananas, the blueberries, the coconut and the nuts and the butter I slathered on there…yes, this is the best banana bread you’ll ever make. I know everyone has their version of banana bread, but this one is worth trying. Here’s what you will need: Bananas, buttermilk, granulated sugar, butter, all-purpose flour, coconut, eggs, blueberries, vanilla extract, baking powder, baking soda and table salt. In a medium bowl whisk together 2 cups all-purpose flour, 2 teaspoons baking powder, 1/2 teaspoon baking soda and 1 teaspoon table salt. Set aside. Cream together 1/2 cup butter and 1 cup granulated sugar until white and fluffy; about three minutes. Add 2 eggs, one at a time, until fully incorporated. Slowly add the dry ingredients to the mixture alternating with 1/3 cup buttermilk. Start and end with dry ingredients. The Hungry Housewife said to find four ripe, super nasty bananas to mash up. Do you think these fit the requirements? Two are super nasty and the other two are getting their but were very ripe. Stir in mashed bananas, 1 cup coconut, 1 Tablespoon vanilla, 1 cup blueberries and 1 cup walnuts. I used frozen blueberries which is why they appear so shriveled looking. Lightly grease or line with parchment (as I did) two 8 x 4 loaf pans. Fill both pans with batter and throw a handful of blueberries on top. Bake in a 350 degree oven for 45 to 55 minutes or until a toothpick inserted in the middle comes out with only a slight amount of crumbs on it. Try to wait until it cools before slicing into it. Of course I didn’t wait. I sliced right in. I know, I’m pathetic. How could I wait…just look at it. I wish I could have had a slice yesterday morning…here was the view outside our window in Oregon. It would have gone well with our coffee. 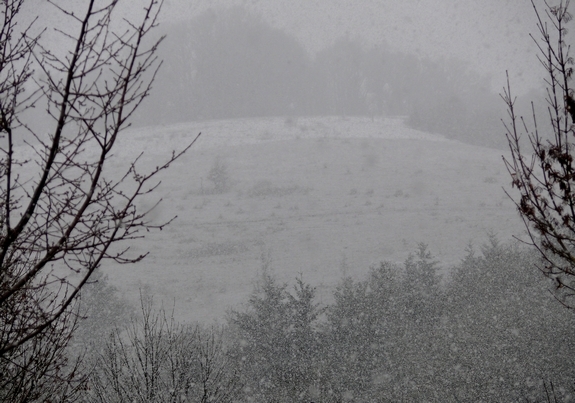 This is not a black and white photo, it was just snowing really hard. Of course the kids were in heaven. In a medium bowl whisk together flour, baking powder, baking soda and table salt. Set aside. Cream together butter and sugar until white and fluffy; about three minutes. Add eggs, one at a time, until fully incorporated. Slowly add the dry ingredients to the mixture alternating with buttermilk. Start and end with dry ingredients. Stir in mashed bananas, coconut, vanilla, 1 cup blueberries and walnuts. I used frozen blueberries which is why they appear so shriveled looking. Try to wait until it cools before slicing into it. I didn’t. I must say it is the best looking banana loaf I have ever seen. I am not normally a fan!!! With the melting butter, it looks so divine!!!! The texture looks amazing! I’m always nervous to make banana bread because it’s my mom’s “baking star” and you know how it is with mom’s cooking (you can’t ever top it!). But this one is totally different with all the yummy add-ins. I’ll have to try it! Coconut in banana bread? That’s genius. I can see what it’s the best! Coconut is that secret ingredient in so many recipes (my bread pudding,for example, 😉 ). And I really like the idea of ripe and mushy bananas — gives depth of flavor and texture. Brilliant. It sure does look like the best banana cake! It looks so moist and looks really good with the berries and butter! How could that Banana Bread be bad? Wow it looks amazingly moist and flavorful! Looks like you have some great hills for sledding! Lucky you! I bet that smelled wonderful whilst baking. I think it’s an omen that I have some overripe bananas (that’s just my nice way of saying nearly rotten!) and blueberries on hand. Must make this. Well, sans the nuts because they make my tongue swell…which is unfortunate because I love them! Oh man. That looks so good. I want some now! Ohhhhh, yum. I must say, that looks much better than my recipe! Another wonderful way to use my baking bananas in the freezer. This bread looks fabulous! I have to agree with others that the coconut convinces me it’s the best. Great snowy photo, too–hooligan heaven indeed! Wow, what a great texture! These Banana Breads look scrumptious! I am so all over this as I love baking with bananas! I am so adding you to my bloglist thingie, I dont want to miss your stuff! I love your recipes!! Looks absolutely delicious. I am definitely going to make this banana bread. I see nuts in the ingredients, and I assume they are pecans? Also, the picture of the snowy view from your window will be so comforting when you are in your new home out there! I don’t think it’s fair to call that banana bread! It’s Banana-Blueberry-Coco-Wal-Nut extravaganza. And I want some. I’d never think to add blueberries or coconut to banana bread. I’ll bet it was good! What a great picture! It’s funny, isn’t it? When it gets cloudy and snows, everything takes on a very black and white look. It always reminds me of Ansel Adams photos. Beautiful! I love the idea of blueberries in the banana bread too – it looks so delicious and healthy! Oh man that looks good – I’ll have to give that one a try. It was a real shock waking up yesterday to snow, especially since the week before it was over 60 degrees. This bread looks heavenly. Warm with butter…wish I had a slice. Oh my goodness I am a star! I made to to your website!! I am sooooo glad you liked my banana bread!!! After years of tinkering w/ the recipe, I think I came up with a keeper!!!!! Thanks so much again for featuring my Banana Bread!!! Yum! I’m making this tonight! ditch the blueberries and add pineapple. Pina Colada Bread! YUMMY! These look divine! I hope you are doing well Cathy! WOW. I make a mean banana bread but this looks amazing!!! I mean, really, really good! However, I must say that one of the reasons I make banana bread is just to use up those bananas. It’s something I can make without any special ingredients and I don’t usually have blueberries or coconut lying around (although maybe I should.) I tend to make goodies that use up my pantry stash and don’t require extra ingredients. Stinkin’ yum! NOw if we could just get Leslie to give out her top secret chocolate chip cookie recipe! She said she won’t even give it to family members! Sigh. Now those are some serious pictures of warm bread with melting butter on it. I am trying this now. No more words or encouragement needed. I love coconut in breads. WOW does that look so DAMN good – Love how she changed it up and created her own masterpiece!! I tried this recipe a while back and it is definitely the best one out there that I have found! Such a tranquil picture of the snow. I almost wish it would snow where I am…almost. Oh my does that EVER look good! I’m making that later today. Have you ever made Penzey’s Alabama Blueberry Bread. It’s VERY good to. I love pointing out the line in my cookbook that says “allow banana bread to sit overnight before slicing.” Drives my family completely crazy. We never wait either. We’re such mavericks. This looks awesome. I threw some mini chocolate chips in my last batch of banana bread and I was Queen For a Day around here. The masses are so easy to please, aren’t they? Yummmmm! This has all the elements of death by deliciousness. I’m trying so hard to diet and you are not helping!!! I gain pounds just reading your posts. Cathy, that is indeed look divine! Leslie’s banana bread does in fact look like the best recipe – ever. And your photos are awesome. I want to take a big bite (or 20) right now. My family eats bananas so fast they never get brown. I’m going to have to hide some to make this! Love your snow picture. I would have been in heaven right along with the boys. I LOVE snowstorms! Ooooh–that looks good! I love the idea of the banana w/ blueberries! Nothin’ better than bread warm from the oven and slathered with butter! Doesn’t get much better than that! That bread looks yummy. I agree. This looks delicious! You can never have too many worthy banana bread recipes. I love making banana bread. This is a recipe that I bookmarked. Thanks for sharing. Ohhhhhh. Why can’t we have a piece of this right now? Of course all banana breads have to be eaten very warm so all the butter melts right into it!!! We wouldn’t be able to wait either. Omigod that looks so good–imagine my devastation when I realized it had the dreaded banana in it! Yet another recipe making me desperately wish I liked bananas. OMG…This will be on my baking list this weekend. I may have to have one taste as well. Love the snowy photo!! Beautiful! This sounds wonderful! I will have to make in the near future. Thanks for sharing. Um pretty sure I wouldn’t be able to wait to cut into that too! My daughter would love this recipe – thanks! I think this is the first time I have ever seen blueberries in banana bread. Not that I think that’s a bad thing mind you. I’m loving this recipe. Sorry about your snow. The east coast is being hit with some incredible spring-like weather today, but I can’t enjoy it as I’m stuck in the office. What a beautiful view…just amazing. And the bread I must make it…what a great twist on banana bread! I think by the looks and sound of it, Leslie is right about her banana bread, and I have been feeling like baking something filling and good for awhile . This banana bread seems to fit the bill! Your outside scene looks like our outside scene yesterday, but the sun is shining brightly now…maybe a bit of spring…oh won’t that banana bread be wonderful for breakfast on the porch with fresh coffee ? I have two nasty bananas to use up, I really want to try this! Anything with coconut makes me happy. It snowed yesterday in Portland too – my kids had so much fun playing in it. Of course you could not wait!!! Gotta admit it. I would never have thought to put blueberries in my banana bread… but why not?? this looks great! I love banana bread any day of the week! Oh wow … this looks fabulous. I haven’t made banana bread in YEARS! Well, I wouldn’t wait either, when the bread looks that gorgeous! That does look like the best! I am going to try it, I love the blueberry addition. You know, I might just have 50 versions of banana bread…all of which I make!! But THIS one, I mean, THIS ONE!! I’ve never used blueberries or coconut, and now I feel betrayed by my own lack of creativity. Thankyou to you and Hungry Mom! Looks like a nice upgrade from the usual banana bread…I couldn’t have waited either! I have to agree! I could use a piece of that myself! I never can wait till bread cools to slice it! This looks so heavenly. I have never found a banana bread recipe that I love, I’m going to have to try this one out! It’s looks delicious. Looks like the best ever-I’m going to soon find out for myself! Oh my….this looks like it totally outdoes the banana bread I just made. Good thing my loaf is gone, because I’m going to have to make this one now!!!! That does look like a heck of a banana bread. And I’m definitely trying the blueberries and coconut next time I make a loaf! That snow shot looks crazy. I have to say, though I never thought I liked banana bread, that blend of ingredients, along with your delicious photo, make me really want to try it again. Nice job on Leslie’s part and thanks for sharing it further. My two loaves just came out of the oven. The house smells wonderful. I, too, couldn’t wait for it to cool. My husband and I just ate two slices with butter. OMG!!!! I’m trying your bacon pull apart bread tomorrow for brunch. Thanks for all the great recipes. This is one of my very favorite sites. I just tried this recipe, it is *really good*. I’m not sure I would have tried it if you hadn’t said “She said it was the best”. I’m always up for a challenge like that. haha. These don’t really compare because they are very different styles (one is bread, one is “cake”), but I think this is still my current favorite: http://www.seriouseats.com/recipes/2008/03/banana-cake-big-and-small-recipe.html. Yummy bread and wonderful winter sight. I have added coconut to my banana bread for years and have always gotten rave reviews on it. Banana coconut and blueberry together… ahhhh…must be like heaven. I just made this last night (minus walnuts). I was so excited to make it, and it’s amazing, but it’s probably the worst thing to share between my roommate and I. She hates blueberries and I hate walnuts. I think I’m going to have to split it halves next time, one with walnuts and one with blueberries. Anyway, thank you, this is amazing.